Late 1998, Mayo Boddie, Sr. had a vision of another opportunity for the Boddie-Noell Family. 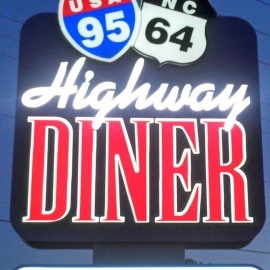 After traveling across the United States and eating lots of eggs, meatloaf, and banana splits, the decision was made to create the "Highway Diner." With a site located, land was purchased and Managers hired, a menu was developed and equipment ordered. The uniforms, plateware, pots, and pans were selected to fit the unique design. In the summer of 1999 construction began in anticipation of the arrival of our diner. In August, the Diner arrived on several trailers and a crane began placing each part of the diner in place. October of 1999, construction turned the building over to Operations and the first meal was served in early November.